We received complimentary Sweet Art Edible Play Dough toys for kids in exchange for an honest review. All opinions are our own. When I first thought of the idea of edible play dough, I must say I was skeptical. 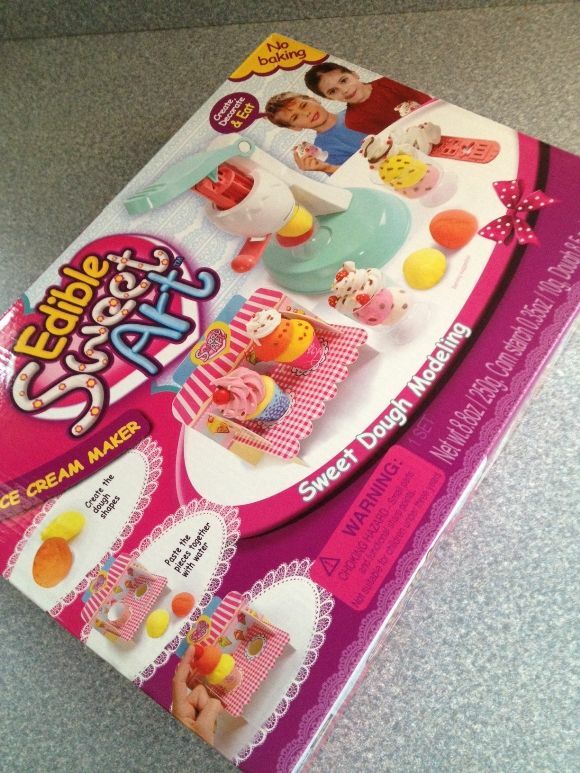 But as you know, children love items that they can play with and eat as well, so I stayed open minded when trying the Edible Sweet Art Ice Cream Maker set by Diamant Toys. Right away, I was impressed by the colorful and sweetly colored packaging, and my children were fascinated by the idea of dough they could EAT! 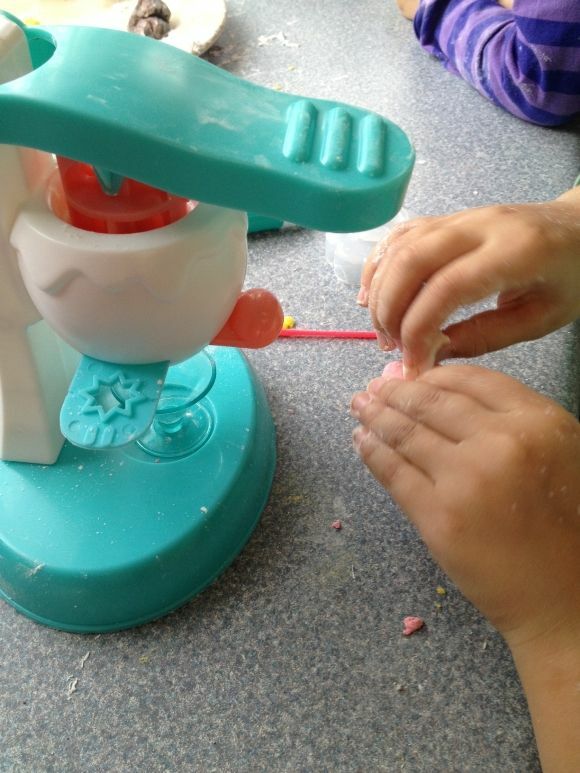 Sweet Art Edible Play Dough makes fun toys for kids! 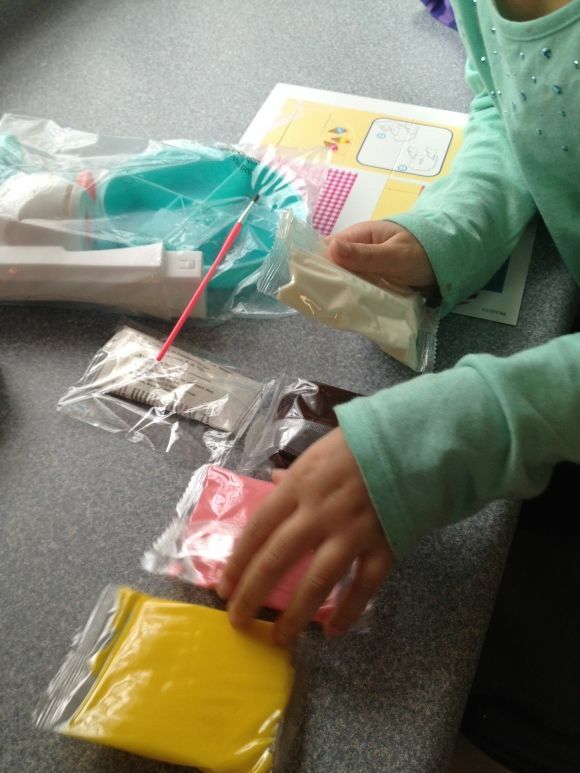 When we opened our kit we found assorted sugar dough in a variety of colors, a rolling pin, brush, ice cream machine, ice cream cups, ice cream stand and instructions. The kit was very simple to assemble and just took me a few seconds. The children ripped into the dough right away, which believe it or not tasted just as good as it looked! And in case you are wondering, yes, I tried some too! The flavors were vanilla, chocolate, strawberry, and a lemon flavor. The dough was soft and easy to mold and build with, and the tools that came in the kit all came in handy for crafting all sorts of tasty treats. The children set up their own little ice cream shop, sneaking bites of dough as they did. They had fun operating the ice cream machine, that with a simple push made swirls and all sorts of other shapes. The included cornflour powder kept the dough from sticking and made it easier to work with. It was an appreciated bonus. 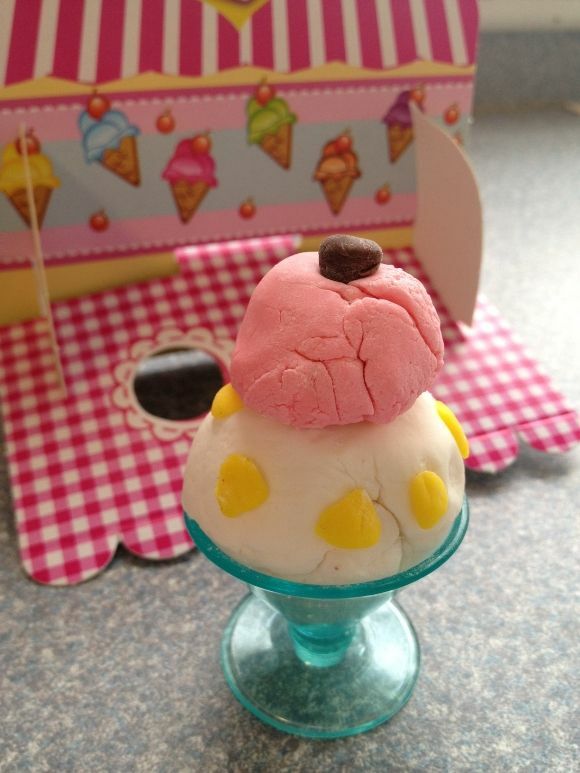 While the thought of edible play dough first confused me, the Edible Sweet Art kit from Amav Diamant Toys made it all make sense. It is in fact a fun way to play, and with younger children you don’t need to be concerned should they decide to put some in their mouths. The dough is FDA-approved and safe for kids. When the fun is over, you can put the dough in an air tight container. We had quite a bit left and were able to safely store it until we were ready to play again. Storing it in an air tight container is important, as I noticed the longer we played the quicker it dried out. I would highly recommend these toys for kids who love being creative and trying new things! 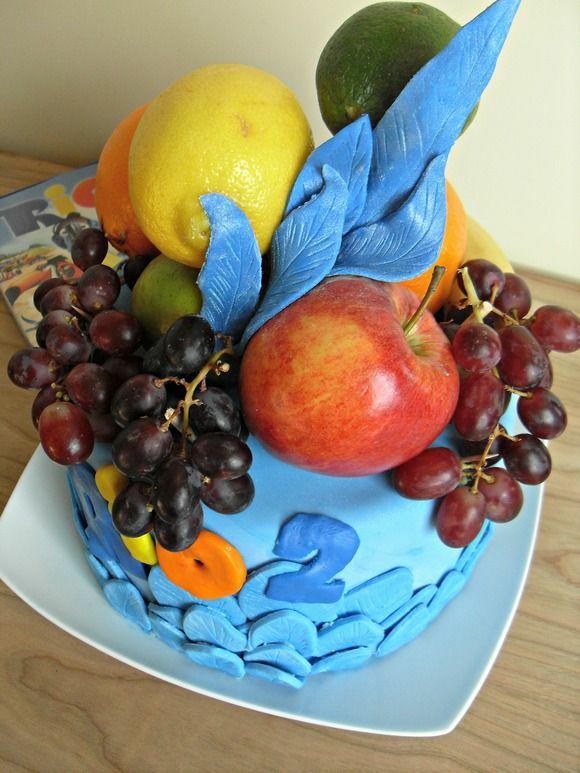 It is fun, it is colorful, it is easy to use, and most of all, it is edible! That is a combination of every child’s dream toy in one. 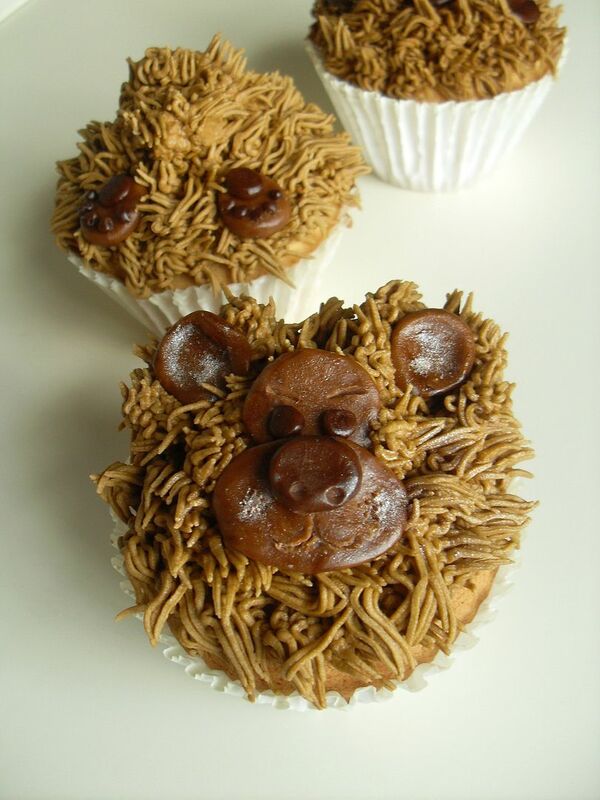 Find Edible Sweet Art toys for kids at Amazon, ToysRUs, Kmart and Hobby Lobby! Looking for more great toys for kids? Check out our review of Pinypon Weekend Getaway Hotel and Super Duper educational toys for kids! 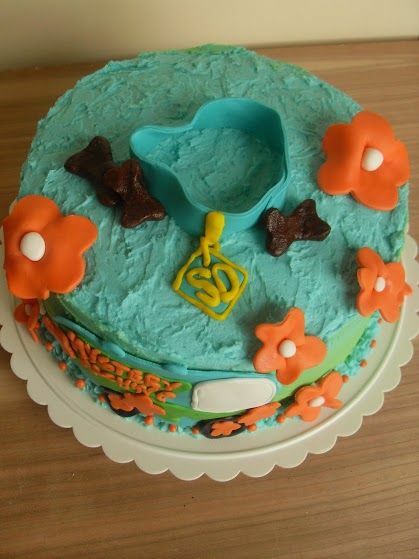 I would love to give this to my granddaughter Larkyn, she is so creative! Wow, what a great idea!! We LOVE play dough. My girls would love this! Great giveaway, terrific idea. I’d give this to my son, and we’d both play with it. I would give this to my two year old granddaughter who is at an age where she is still putting things in her mouth. I would give this to my kids, but I’d invite our cousins over for a playdate since they would enjoy it too. I would love to give this to my children. This would be a great toy to have at my house on a day like today when it is too cold to play outside and for the granddaughters to do and use their imagination, this sounds great. I would give this to my son’s therapist. She uses play dough with the kids all the time. 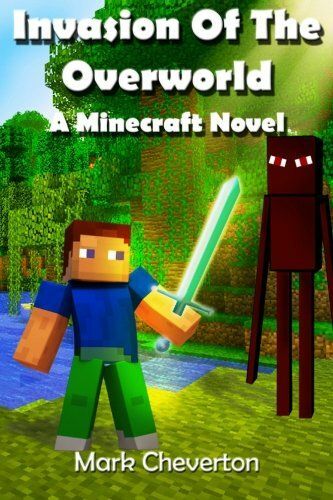 I would give this to my son if I won it. I would love to give this to my daughter. My daughter would like it.